RoohAfza has never needed any introduction in India. This natural, herbal based, refreshing energizer has been around since 1907. I remember my grandmother adding RoohAfza to Dahi bhallas, phirnis, kulfi and faloodas to enhance their taste. Who can forget that Roofafza flavoured thandai we had on Holi? With changing times, I have got around to using this yummy thirst quencher as an ingredient in my summer drinks for my family and sudden guests. I add RoohAfza to my breakfast granola, ice-cream toppings and even to the ice lollies that I serve to my kids! Put the probiotic dahi, crushed ice, water and the RoohAfza syrup in an electric blender and mix for 10 seconds till its slightly frothy. It imparts a pretty pink hue. You can also use a hand blender to blend your lassi. Pour in 2 tall glasses and garnish with finely chopped pudina. Decorate with crushed cardamom and rose petals. 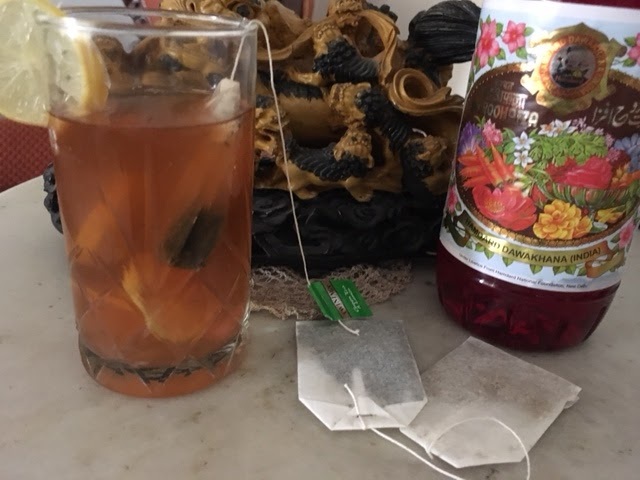 Notes – I skip the sugar since I’m adding RoohAfza. I also add a drop of vanilla essence sometimes (for a fancy touch to my Lassi). You can also substitute your dahi with buttermilk (chaas). This is lighter and readily available in our Indian market. The resulting drink is a light, frothy Roohafza Chaas. Add 2 tbsp. RoohAfza each into 2 stem glasses. Swirl it around so that the syrup sticks to the sides. Gently pour in the Grapefruit juice. Further add the lemon juice. Pour in the chilled soda and crushed ice. Garnish with lemon slices and mint. Notes – I sometimes substitute Grapefruit juice with either Orange or Guava juice. You can also open a tin of fruit cocktail and add some chopped fruit to this fruity minty punch before serving. 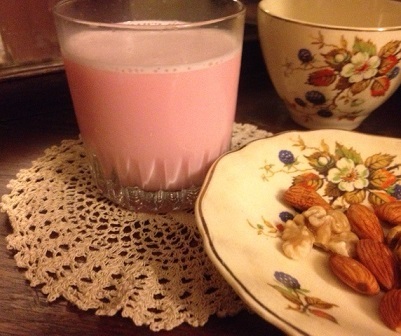 Blend the chilled milk, RoohAfza, cardamom and rose water in a blender for 10 seconds. Pour the milk in 2 tall glasses and scoop in the almond/pistachio wet mixture (refer notes) with a spoon. Add some dry cardamom and nuts on top before serving. Notes – I usually wet grind the almonds and pistachios in a food processor with some milk and keep aside. I separately dry grind some almonds/pistachios into a fine powder for garnishing in the end. The iron and calcium in the dry fruit gives a good boost of energy. You can always increase or decrease the quantity according to your taste. Bring 4 cups of water to a boil. Add the tea bag and let it steep for 4 minutes. Remove the tea bag and let the tea water cool down completely. Place the sliced strawberries and chopped basil in a large bowl and pour the tea mixture over this. Stir in the RoohAfza syrup and let everything infuse for 10 minutes. Transfer this to a jug and add the remaining 4 cups of water. Let it refrigerate so that the flavour of the iced tea comes out completely. Stir before serving in long glasses over crushed ice. Garnish with basil or a lemon slice. Notes– You can substitute the basil with mint (pudina) leaves if you want. Though I prefer the basil for its unique taste and healthy properties! I sometimes use an orange when strawberries are not in season. In that case, I remove the skin and slice 1 juicy orange to add to the iced tea. Add the bananas, RoohAfza, chopped pineapple, juice and coconut milk to a blender till it’s smooth and creamy. Pour into 2 big glasses and garnish with coconut flakes and a pineapple wedge on the side. Notes – I sometimes pour the coconut milk into an ice tray and freeze it to make coconut ice cubes which my kids (and their friends) really enjoy. 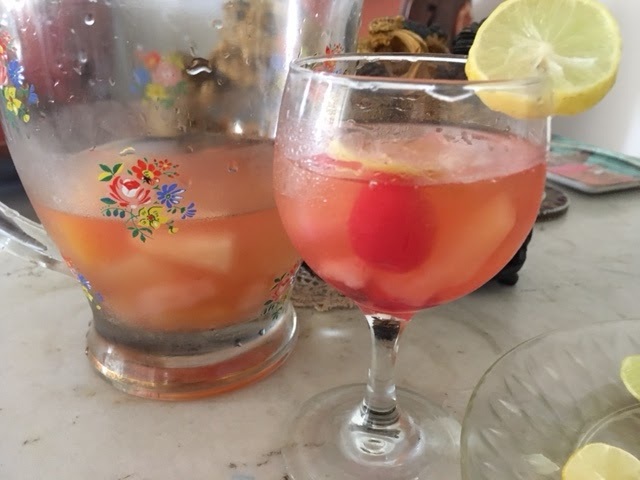 This is a non-alcoholic mocktail recipe; otherwise Rum can be added to make Pina Colada cocktail for adults. You can add crushed ice to alter the consistency of this drink. RoohAfza has been a celebratory drink for generations. This exotic concoction beats heat exhaustion and helps enhance the flavour of smoothies, mocktails and tangy punches. It is a natural, herbal coolant packed with 13 herbs and fruit extracts. So, it is much better than the carbonated drinks and artificial sodas (with empty calories) that are flooding our Indian markets today. All thumbs up to the original Sharbat – Roohafza! Previous Post Solving my family’s eternal milk dilemma for life! Next Post 8 Easy ways to Stress Proof your life. Nice herbal and refreshing summer energisers.so easy to make too. Yes, and tasty too Amir ! 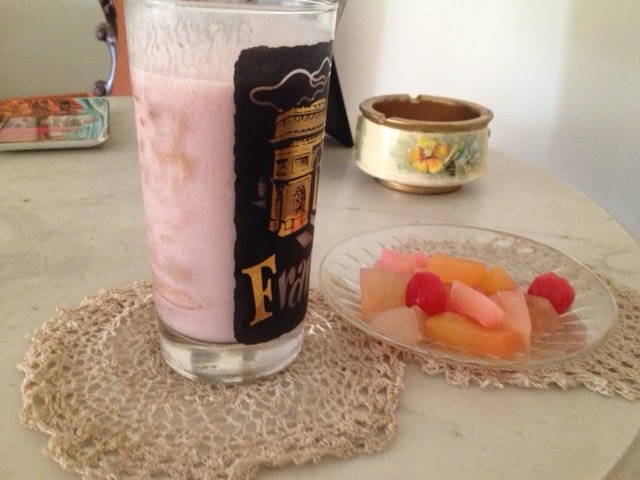 Thanks for sharing these…they look very refreshing and tasty! Looks like spring is finally here in London so these recipes are going to come in very handy! I’m a big fan of Pina Coladas so I’m going to give the Healthy Pineapple and Roohafza Pina Colada recipe a try. These are so unique! I love it! As someone who can’t drink alcohol, I’m always looking for new hot weather drinks to wind down! Also, I first had a lassee for the first time back in February and they’re so fun! As a child I used to love roafjah. Loved the rose scent. Really like the various versions of them here. May have to try a few! Almond milk will be better for my girls except a hot glass of milk in morning!!! Other drinks are also refreshing and herbal!!! Oh my these are not your ordinary chilled drinks. Definitely a conversation starter. That Minty Grapefruit and Roohafza Punch is right up my alley, I love grapefruit! These sound like awesome drink to make. As it’s coming into summer, I’m going to try to make some for BBQs, which are coming up.